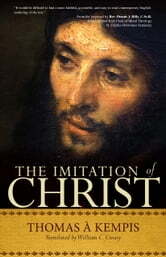 That’s the primary question Thomas à Kempis answers in his universally acclaimed work, The Imitation of Christ. In 114 short chapters organized into four simple parts, this handbook on the spiritual life offers guidance on dozens of topics such as resisting temptation, avoiding hasty judgments, putting up with others’ faults, remembering God’s many blessings, self-surrender, minding our own business, and performing humble works. William Creasy succeeds in creating a dramatically different interpretation of The Imitation of Christ by working through its historical, cultural, and linguistic contexts. This book inspired the likes of St. Thomas More, St. Ignatius of Loyola, Thérèse of Lisieux, Dorothy Day, and Thomas Merton. Along with such classics as Augustine’s Confessions, Teresa of Avila’s Interior Castle, and Ignatius’s Spiritual Exercises, The Imitation of Christ continues to confront each generation of readers with the perennial truths of the Gospel.